Induction cooktop is not a new concept altogether. It has been in action from 1933. Though early models had many limitations, but as time passed by, induction cooking technology achieved new dimensions. Still, it can be termed as a Niche Market. When we have a look at the market share we can see that in the 1st quarter of 2018 the total amount of sales of the induction cooktop is about 13% of the overall sale in the USA. In the European market, the percentage is higher though It’s 29% in Germany and more than that in some other European countries. We are not seeing an overwhelming amount of sale of induction model cooktops all over the world. One major reason behind it may be that people in general still wonder how this thing works. Well, we are here to put details on that. 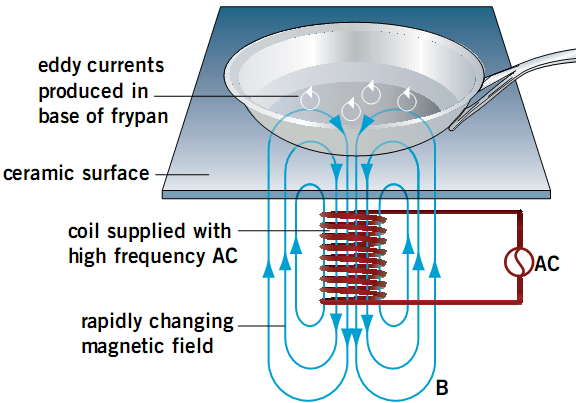 An induction cooktop holds a coil of copper wire underneath its surface. Through this coil, an alternative current, which changes direction generally 20-30 times/second, is passed that creates an oscillating magnetic field. This magnetic field then induces a magnetic flux. When you place a cooking pot over the surface of the cooktop, this magnetic flux magnetizes the pot in a repetitive manner. But the materials used to make the pot don’t allow it to be magnetized. It continues to resist the field. And the result of this resistance is the pot getting heated which makes the whole cooking task easier than before. The Achilles Heel of using an induction cooktop is that you need to have cooking pots that are specially made for the inductions. See, if you want to use just any pot, it won’t work on the induction surface. The pots to be used in an induction must be made out of ferromagnetic metal such as stainless steel or cast iron. Chef star has a reputation of making quality stainless steel cookware. Without the help of these metals, the AC current won’t pass through the cooking vessels. So if you place just an ordinary vessel, the vessel wouldn’t heat up at all. Want to know the Reason Why that Happens? Okay. See, electrons include a property called ‘spin’ that can surround anywhere of the nucleus of an atom. Depending on where they are surrounding, electrons spin in one direction or the other. In a ferromagnetic material, there is an unbalanced set of electrons in which there are more up spin electrons than down spin or vice versa. It means that the atoms that make up the material can behave like a magnet and can be influenced by a magnetic field. In contrast, non-ferromagnetic materials have a balanced set of electrons. For that, they are not induced by a magnetic field as steel or iron. That’s the whole story. Amazing yet very simple, isn’t it? In the near future, the use of induction cooktops will be on the rise. Because one cannot get a more precise heating element than this.